GIVEAWAY: Spooky Trip To LA (And Hollywood's Most Haunted Places)! On my road trip last week, I slept and took photos in some awesome allegedly haunted places in Arizona, and although we didn’t come across any ghosts, my craving for spooky isn’t going anywhere. Which brings me to the best giveaway EVER, in celebration of The Possession coming out on DVD: A trip to LA and some scary fun to go with it! See sweepstakes information at the bottom of this blog. 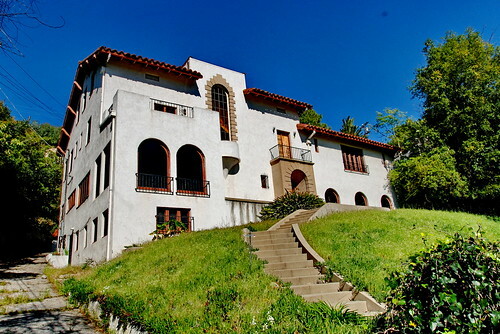 And on your way down, check out some of the scariest places in Los Angeles! 1.) The Queen Mary, Long Beach This historical ship docked in Long Beach has seen the deaths of just under 50 people. Serving as both a World War II transport ship and a luxury liner, one of the ship’s famous ghosts is John Henry, who was crushed to death while trying to flee a fire. Ever since, strange knocks and lights have been noticed around engine room 13 where he died. Many also see the ghost of a young third-class girl who broke her neck while sliding down the banister. She is said to wander through the pool area along with two other mysterious female apparitions. A haunted LA classic. Years later, celebrity hairstylist Jay Sebring, who would later become a victim of the Manson family murders along with his then-girlfriend Sharon Tate, was living in the very same house. One night in 1966, Sharon was sleeping alone in the house and couldn’t shake an uneasy feeling. While she was lying in bed with the lights on, a “creepy little man” whom she recognized as Paul Bern suddenly came into the bedroom, looking around for something. She left the bedroom in a hurry, starting down the stairs, and froze when she saw a figure tied to the staircase with his or her throat cut – not far off from the way her own life would end three years later. It then vanished. Sharon, looking for a drink, tore a piece of wallpaper without thinking. The next morning, she was convinced the whole thing had been a nightmare – until she saw where she had torn the wallpaper. 3.) 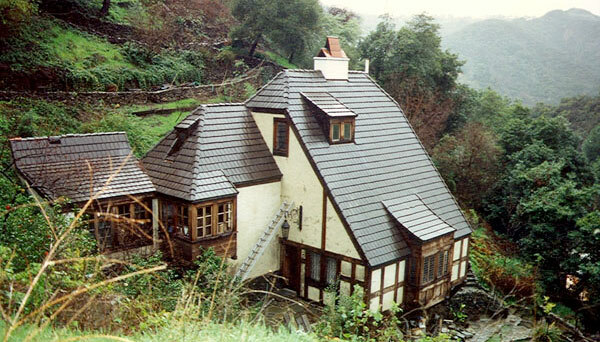 The Perelson Murder Mansion, Los FelizIn December 1959, Dr. Harold Perelson, a heart specialist, beat his wife to death with a hammer, then severely beating his 18-year-old daughter Judye while his two other children were asleep. Judye survived and ran to a neighbor’s house to call for help, and when the younger children woke up and asked about the screaming, Harold told them it had only been a nightmare and that they should go back to sleep. He then drank acid, killing himself instantly. After the horrible incident, the children were sent to live with relatives and the mansion was locked up. Scary, yes? But then, a year later, a couple purchased the mansion, and though they occasionally visited and stored some possessions there, they never moved in – nor did they move the Perelson’s things out. Rumor has it that the house is still in almost exactly the same state as it was that evening – including the family’s Christmas gifts still on the table, and the Christmas tree in the living room. The current owner refuses to sell the home, but doesn’t move in. Very mysterious. Broadway actress Peg Entwistle moved to Los Angeles in the 1930s to make a name for herself in film. She finally got a contract to act in a film called Thirteen Women, but the film did poorly and most of her scenes got cut out of the edit. 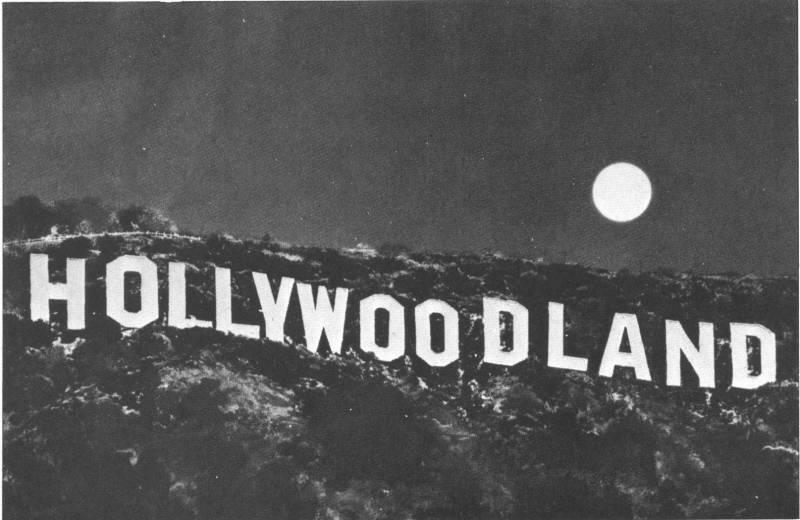 When auditions were fruitless for the next few months, finally, in September 1932, the 24-year-old climbed to the top of the “H” in what was then the Hollywoodland sign and threw herself to her death, her body soon to be discovered with a suicide note in her purse. People now catch glimpses of the figure of a woman in white ’30s attire lingering around the area, looking distraught. 5.) 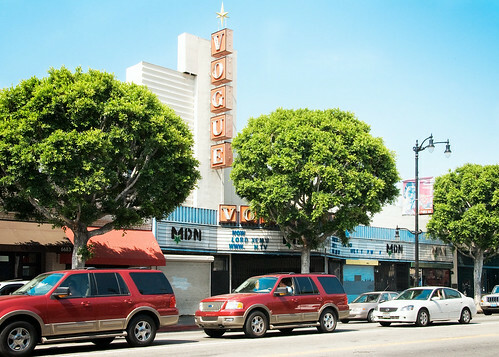 The Vogue Theater (Supperclub), Hollywood The Vogue Theater was built on the playground of Prospect Elementary School, which burned down in 1901, killing 21 children and their teacher. It was turned into a factory before burning down again, finally becoming the Vogue Theater in 1936. From 1997 to 2001 a paranormal research society took over, using the theater as a research site and hosting psychic performances. They claimed to have cleared the theater of seven ghosts, including an projectionist named Fritz who’d died in the theater. Now a club called Supperclub, people still have ghostly encounters with the children. The Colorado Street Bridge, nicknamed Suicide Bridge, was built in 1912 and is a gold mine of hauntings, most famous for hosting nearly 50 suicides during the Great Depression. The total is now over 100 (still about ten every year). Suicides aside, a worker who fell into the wet concrete while the bridge was first being built was supposedly left there, frozen in the cement – and, they say, calling out to potential jumpers to join him. And in 1937, when a woman threw her baby off the bridge before jumping herself, she met her end but the baby landed in a nearby tree and survived. They say she still haunts the bridge, searching for her child. Various ghosts are seen here, including a female figure in a long flowing robe who stands on the edge of the bridge and throws herself off before vanishing. Spooky. OKAY SWEEPSTAKES INFORMATION!!! !In celebration of The Possession DVD coming out, Buzznet is hosting a sweepstakes giveaway for (1) grand prize trip for two (2) to Los Angeles, CA including roundtrip airfare, two (2) nights hotel accommodation, two (2) tickets to a Hollywood Ghost Tour (i.e. Dearly Departed), two (2) DVD’s of The Possession and $700 to be used for ground transportation and incidentals.